A woman as diverse and colorful as the outfits she wears with pride, Carol Bailey has graced Stony Brook Wildlife Sanctuary with over 44 years of service! 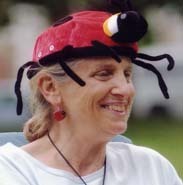 Carol first came to Stony Brook when she began her career as a biology professor at Dean College. 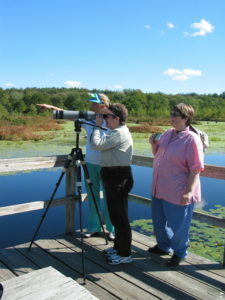 At first, she became involved with the Stony Brook Bird Club, the Stony Brook Camera Club, and the annual Fall Fair as a volunteer. Then, in the 1980s Carol began to offer her strengths as a teacher by working as a part-time naturalist for field trips and/or birthday parties. Unfortunately, health problems prevented her from continuing her naturalist guide work along the sanctuary trail. 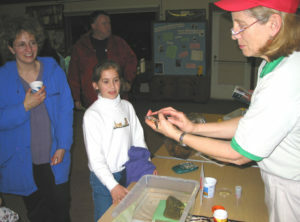 Never accepting limitations, however, Carol has continued to share her passion for teaching and the natural world as a weekend docent stationed along the trail, out on the boardwalk, or at the sanctuary building check in. Carol has an encyclopedic knowledge of natural history that courses through her veins and is always willing to share what she knows. At a very young age she was drawn to the natural world and sought answers to her many questions about the local ecosystem. She laughs recalling her insatiable curiosity saying, “If I could carry it, it was coming home!” This same childhood curiosity and sense of wonder is what she imparts to every volunteer she mentors or visitor she engages. She had the good fortune to have parents who nurtured and encouraged her in her desire to know, and feels that she should do the same. She recalls fondly how her father would bring home salvaged cages and aquariums to house her new discoveries. As a classically trained musician, Carol’s mother would help her to see the beauty of nature through the sounds and notes that filled the air. These early experiences contributed to her seemingly innate ability to stir the same wonder and enthusiasm in her visitors to the sanctuary today. I hope you have a chance to meet Carol, look for her on most sunny Sunday afternoons at the sanctuary, either inside or outside. She is affectionately known as the “Nature Answer Lady” and is apt to be adorned with very colorful attire. Be prepared for any question directed her way; if she does not have the answer, she will take you on a journey to discover one. That has always been her way. If you are interested in becoming a docent, perhaps you will work with Carol as a mentoree and have a chance to witness her genius in person. If you wish to learn more about how you might volunteer at Stony Brook, see this link. Come to Stony Brook today and tap into your own childhood wonder. There is no place like it. This entry was posted in Volunteering and tagged Docent, Norfolk, Stony Brook, Turtle Lady, turtles, Volunteer on March 16, 2017 by Don C.
Can you recall the days of sun and leisure in your gardens during the summer? Have you been left with the impression that the hum of honeybees and the beauty of a floating monarchs are happening with less frequency? You are not alone. It is a fact that our native pollinators are in decline nationally and worldwide. Pollinators are in need of our help to maintain and create a biodiverse habitat in which they can thrive. Approximately 1/3 of our food is dependent on pollination. This is an effort that goes well beyond protecting a species. It involves ensuring a food supply and protecting a way of life. You can make a difference and participate in statewide initiatives to protect our pollinators, our land and ultimately our own well-being. Stony Brook’s efforts to protect the biodiversity of open space and the pollinators who inhabit it have been on-going and typically volunteer centric. Over 3 years ago, for example, The Garden Club of Norfolk adopted and nurtured a variety of plantings at Stony Brook’s once overgrown and ineffective Butterfly Garden. As a means to attract our native butterfly populations, Club members incorporated many plantings within the garden that are both a caterpillar host and butterfly nectar source. Every week from early spring until late fall, the gardeners meet in the Butterfly Garden to weed, water and prune the plantings always looking for additional volunteers. Their efforts have been recognized with awards and grants from many organizations such as Massachusetts Gardener Association, New England Region of State Garden Clubs and the Garden Club Federation of Massachusetts. 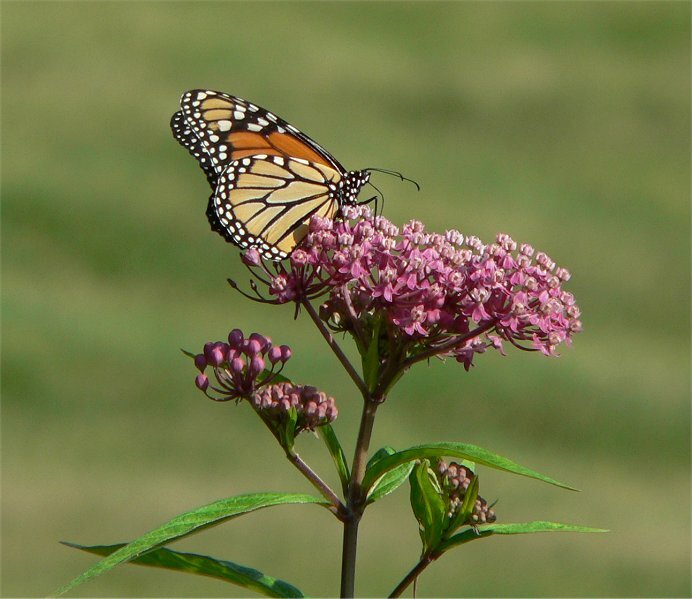 Stony Brook’s Butterfly Garden is also an official Monarch Waystation and Certified Butterfly Garden by the North American Butterfly Association. 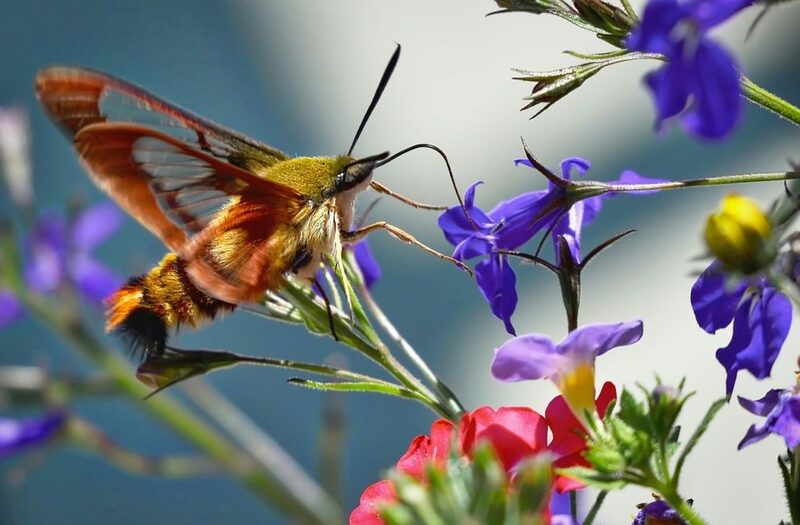 Future plans for increasing biodiversity at Stony Brook include establishing a field of native plantings and improving established gardens to provide habitats for our pollinators and native wildlife. Continuing the removal of invasive and exotic plantings are also an important steps towards creating a diverse habitat. What can you do to protect and restore pollinators and their habitats? Start by choosing plants in your yard that attract pollinators. Research our native bee populations and how you might be able to create a bee home. Fill out an application and join the Stony Brook volunteer team. We believe our efforts, no matter how small, are making a difference. It all starts with one simple step towards a common goal. Hope to see you at Stony Brook! This entry was posted in Birds & Wildlife, Volunteering on February 8, 2017 by Jessica W.
Curious about how you can make a difference with only a couple of hours to spare this weekend? 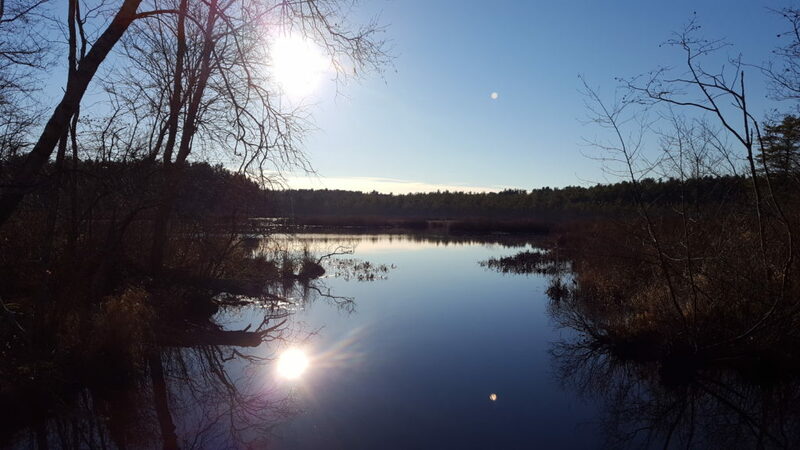 Join the Stewardship Volunteer Crew at Stony Brook Wildlife Sanctuary this Sunday, January 8th at 1pm and enjoy the peace and tranquility of the open fields and wetlands in Norfolk. Come and work beside other volunteers who share a common desire to protect and care for our wild spaces. There will be a something sweet to eat and a warm welcome for you inside the sanctuary upon arrival this Sunday, January 8th at 1pm. Matt O’Neil, sanctuary property manager, will lead the team and provide a brief training and explanation of the task for the day that may include removal of invasives. Stony Brook Stewardship Day is an opportunity to learn more about our natural world. 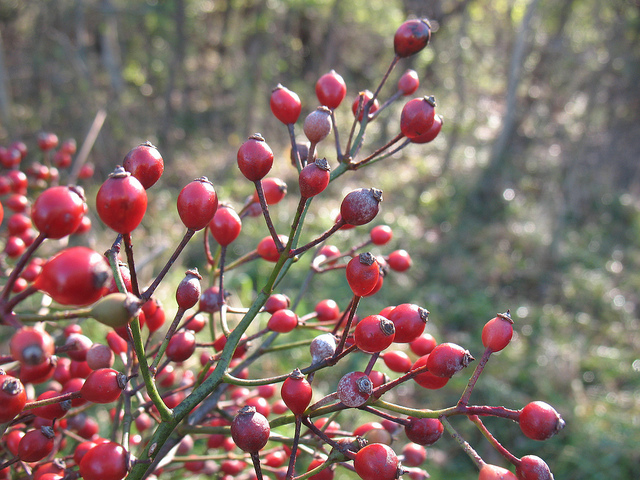 Perspective of our landscape becomes better informed as we come to learn about invasives such as the multiflora rose that will take over the natural habitat of our fields if not managed. Learn more about Mass Audubon’s management of invasive species and if your own backyard is host to these alien invaders. This entry was posted in Programs & Events, Volunteering on January 4, 2017 by Jessica W.
Stony Brook volunteers, mark your calendars! Saturday, January 11th, 2017, at 12 noon, the sanctuary staff would like to honor our volunteers and their service to Stony Brook. Whether you have contributed 2 or 200 hours toward Stony Brook’s operation, make sure to come to this special event. Teal Marsh vista from the first spillway. Photo taken by volunteer, Jessy Billman. At this luncheon, you will meet other volunteers who share similar values of land protection, education, and conservation advocacy while enjoying a light meal provided by our staff. Those volunteers who have dedicated over 50 hours in 2016 are specially honored with a Mass Audubon Volunteer ID card. This card will grant the card holder to free admission to all Mass Audubon sanctuary sites as well as reduced or free admission to participating cultural institutions. There will be more specifics regarding the events at the luncheon to follow. Please be sure to mark the date on your new 2017 calendars! If you are interested in joining the volunteer team and working toward earning your own Volunteer ID card, learn more here. 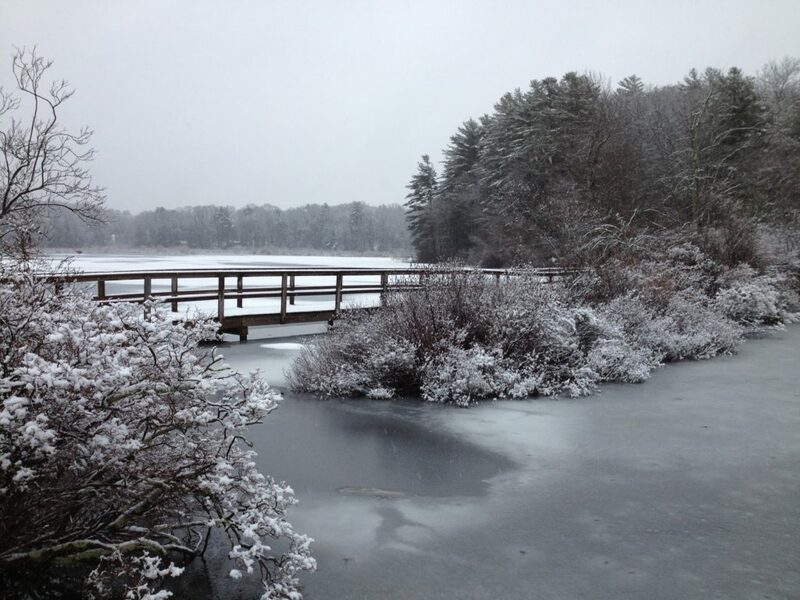 Happy Holidays and hope to see you at Stony Brook Wildlife Sanctuary soon. This entry was posted in Volunteering on December 20, 2016 by Jessica W.
Have the holiday errands got you stressed out and all you want to do is get outside and feel like you are contributing to a greater good? Thinking about volunteering but cannot commit to a set schedule yet? 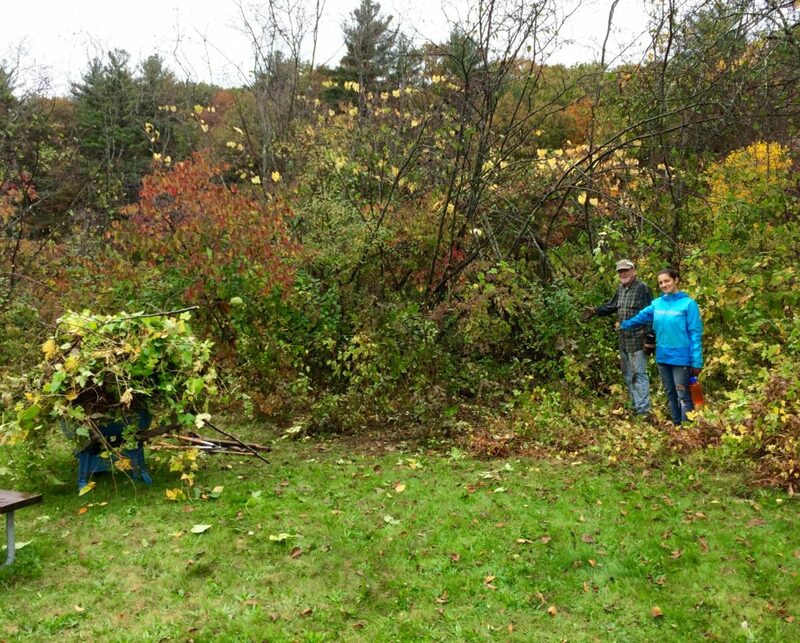 Can you find the wheel barrel in the photo under all the invasive plant cuttings? 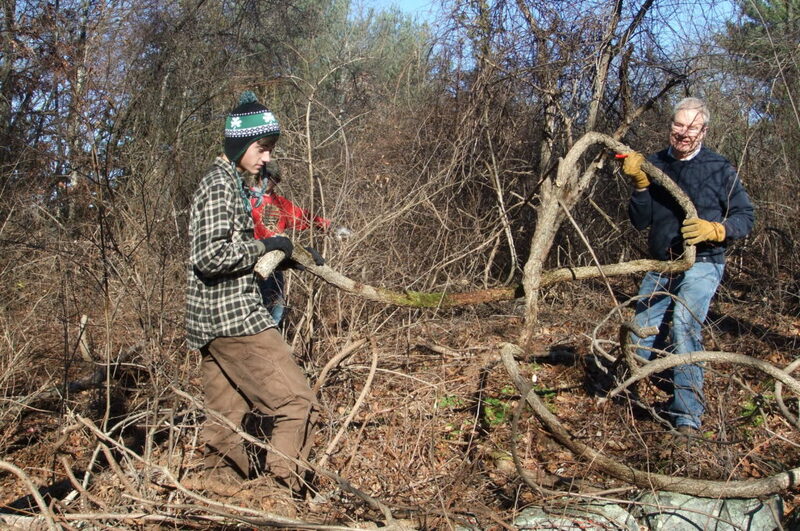 Come to Stony Brook THIS Sunday, December 11th at 1pm for a drop-in Volunteer Stewardship Day. Work with a staff member and fellow volunteers who will head out onto the trails and make sure that sanctuary guests have a fun and rewarding experience on the trails by removing impediments, clearing invasives, and spreading ground cover. 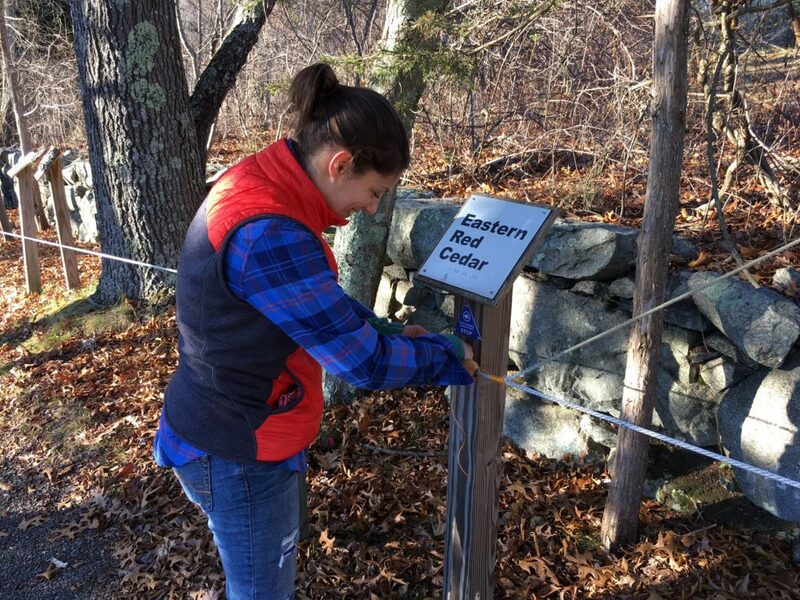 Volunteer Jessy Billman making repairs to Stony Brook’s Sensory Trail. If you cannot make this weekend, set your calendars for our next Volunteer Stewardship Day, Sunday, January 8th, 1pm till 3pm. We hope to see you outside at Stony Brook this Sunday! Feel free to contact us if you would like to apply for a more regular volunteer experience. This entry was posted in Programs & Events, Volunteering on December 8, 2016 by Jessica W.
Welcome to Stony Brook Wildlife Sanctuary’s blog! Ever wondered what goes on at the sanctuary when the hum of summer hustle bustle has gone? Wanted to volunteer but not sure if or how you might be able to serve? Let this blog serve as your connection to Stony Brook during these quiet winter months and beyond. Please participate in the blog by leaving a comment or question and we will be sure to answer. Stony Brook is not the sanctuary it is without the dedication and devotion of its volunteers. We hope you will enjoy meeting some of the volunteers highlighted in our blog’s Volunteer’s Spotlight posts as you consider how you would like to begin or expand your own volunteer experience. 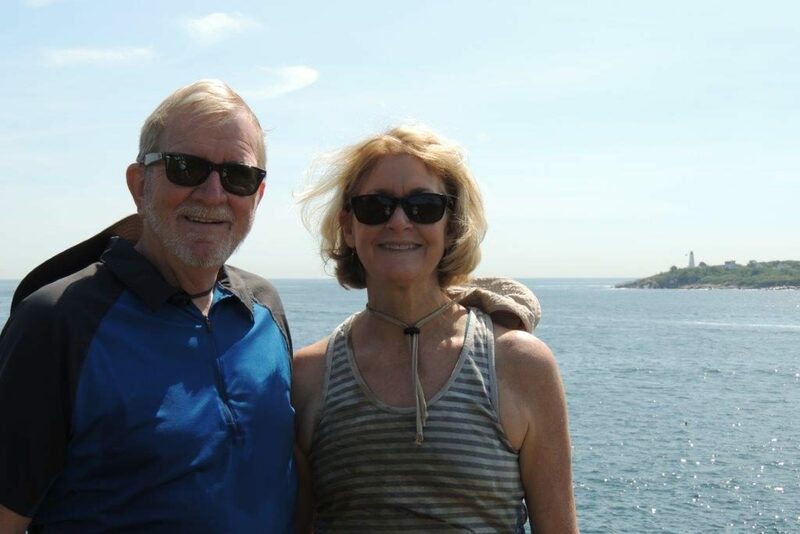 Al and Paula Jesness are a husband and wife volunteer team that has been profoundly instrumental in facilitating the behind the scenes operation of Stony Brook. Beginning as a volunteer over 25 years ago, Paula has served on the Sanctuary Committee for over 9 years. Paula has participated in the growth and development of the sanctuary’s All Person Sensory Trail and has recruited volunteers like Madeleine Linck, a Purple Martin Society member and advocate for the sanctuary’s current population. Paula’s hard work and organizational skills have also helped to ensure a successful Fall Fair for years by soliciting sponsorship and donations. Volunteering at the front desk, Paula’s warm and welcoming personality left all she met with a positive and lasting memory of the sanctuary. Al has worked as a Volunteer Service Day leader, organizing, orienting and inspiring our drop-in summer trail maintenance crew. With an eye for detail and patience to match, Al has also spread the beauty of Stony Brook far and wide, with one of his photos being printed in the March 20, 2014 issue of USA Today. You might want to check out a video of a resident Great Blue Heron’s successful fish hunt Al captured last summer as well. Al’s passion and skills for woodworking have also been put to use when, for the last few years, he hosted a craft table at the Fall Fair and last year ran a public program on building birdhouses. Even the new deck off the sanctuary building overlooking Stony Brook pond deserves some thanks to Al who put in several 8 hour days to help keep the construction on schedule. No task is too great for these two, and they’re not afraid to get a little dirty as well, as evidenced by their working alongside The Garden Club of Norfolk in the sanctuary’s butterfly garden, offering their own gardening expertise and muscle. The Jesness family are an example of the difference we can all make if we share our own strengths and passions. Consider joining our volunteer team and take on a sanctuary project. See what you can do to help Stony Brook Wildlife Sanctuary. This entry was posted in Volunteering on December 1, 2016 by Jessica W.
Amphibians after Dark – coming April 8th! Receive The Latest Posts Directly To Your Email!